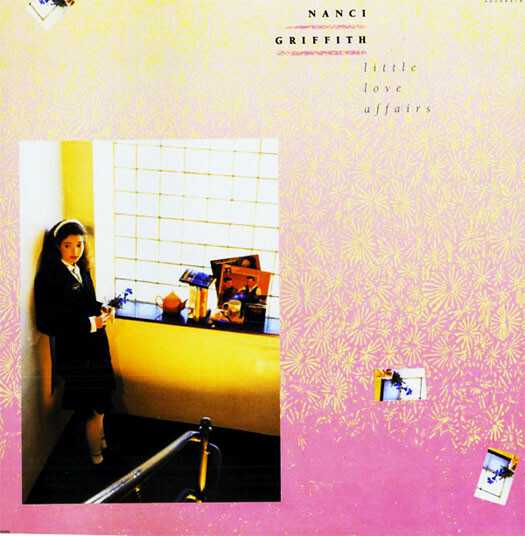 Little Love Affairs is Nanci Griffith‘s sixth album, and it had similar success to the preceding album, Lone Star State of Mind, on the Billboard charts. The album peaked at #27 on the Country Albums chart and one of its tracks entered into the Top 40 of the Hot Country Singles chart: “I Knew Love” rose to #37. Two more tracks also charted: “Never Mind” at #58, and “Anyone Can Be Somebody’s Fool” at #64. Nanci Caroline Griffith (born July 6, 1953) is an American singer, guitarist, and songwriter, reared in Austin, Texas, who currently lives in Nashville, Tennessee.Nanci Griffith appeared many times on the PBS music program Austin City Limits starting in 1985 (season 10).